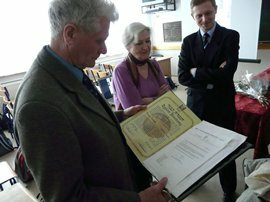 In the first part of the meeting Mr Mieczysław Wójcik recalled Polish-Jewish history of Stoczek Węgrowski. Afterwards, the member of The Lasting Memory Foundation delivered a lecture concerning photographs and accounts of Jewish history in Poland. In the next part of the meeting Jadwiga Gawrych told a story of her family and their brave act of rescuing Jews from extermination. 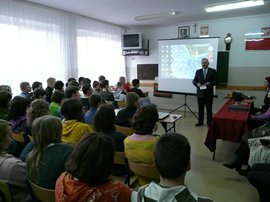 The students could hear a similar story from another guest- Mr Józef Maliński. Mr Jaskółowski presented the project called “Bringing Back the memory” initialized by the Chancellery of the President. 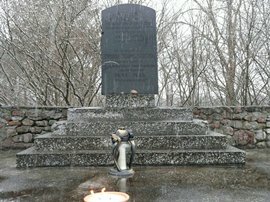 The main aim of the idea is to honor all people who uniquely contributed to the rebirth of sovereign Poland as well as those who brought helt to Jews persecuted during the Second World War. After the meeting guests visited Jewish cemetery and lit the candles on the grave of murdered Jews from Stoczek. They also visited a family of Julianna Postek who died along with 17 Jews hiding in her house.